My career as a professional landscape photographer started on the coastline of Sydney’s Northern Beaches and I have been lucky to remain coastal to Sydney for over 15 years. In that time I have explored pretty much all Sydney has to offer when it comes to locations and I have shot them under all types of light. Click here to see all of the locations on a google map. If you would like to see where to shoot on sunset then look no further and visit Sydney’s best sunset locations to find out. So let’s get started on this journy to show you where to watch the sunrise. Firstly over here on the Eastern States of Australia we have the sun rising over the ocean. So our coastline and all its nooks and crannys are going to be flooded with the morning light as opposed to sunset. So sunrise in my opinion gives you the best light to shoot (yes that means an early start). But don’t get me wrong sunset can be amazing as well, sunrise is just my personal preference. Depending on what time of year your shooting the sun will be in a different location along the horizon line. To check the angle of the sun, along with sunrise and sunset times I can’t promote the Phone App called The Photographer’s Ephemeris, it is also available for your desktop computer as well (Free), but having the phone app on your at all times comes in handy. For the stunning view and ease of getting here we have to start with Milsons Point over looking the Sydney Harbour Bridge with the city in the background. Regardless of the time of year the sun will always fall on the bridge. The view here is clear and looks great shot with a wide angle lens or digital panoramic. The only negative if there is any about shooting here is the New Years Eve light show structure left on the side of the bridge. Can be distracting, especially at other angles. Usually isn’t dismantled until March in the year and then gets re built in November. Location: Broughton Street, Milsons Point. How to get here: Two ferry terminals nearby – Milsons Point and Jefferys Street Wharf. Milsons Point Train Station (walking distance) also Pay and Display parking. On sunrise driving here and parking for free has never been a problem. Whats worth shooting nearby: Walking along the water towards the city will give you full views of the city, or walking around away from the city along the water will give you different views of the Opera House and Bridge with fig trees in the fore ground. Shooting Tips: Great location for your wide angle lenses 10 – 22mm lenses, 17-40 or 16-35mm. ND grad filters will help here but not essential as the sun will be on your left and the light should be controllable in a single frame. A great flattering view of Sydney’s two internationally recognised icons. At the right time of the year you will be able to shoot here where the sun will filter through the trees and fall on the main fig tree (as pictured). Location: Mrs Macquaries Chair Road. How to get here: Bus Service, Walking distance from Circular Quay, Pay and Display street parking. On sunrise driving here and parking for free has never been a problem. Just watch your speed in the area the ranges will quickly be on you. Whats worth shooting nearby: Luna Park and other angles of the Harbour Bridge and City along the harbour foreshore to the left of the bridge. Shooting Tips: Great location for shooting a digital panoramic or for those with a longer lens you can grab some great shots of the Opera House Sails with the bridge in the background. Shooting here on sunrise the sun will be on your back so the light range will not be extreme. Just keep in mind that once the sun does rise the Opera House Sails may over expose and nearby buildings will reflect the sun directly. Location: South End of Bondi Beach off Notts Ave.
How to get here: Bus Service, Walking distance from Bondi Beach, Pay and Display street parking. On sunrise driving here and parking for free has never been a problem. Paid parking starts after 8am. Whats worth shooting nearby: Heaps. Bondi Beach itself, plenty of surfing, along the front of the beach is a legal (by permit) graffiti wall, some great work is always there. The North end of Bondi is a small ocean pool. Shooting Tips: Due to the angle of the beach and headland (Ben Buckler) shooting sunrise south down the beach can be difficult as the sun will rise over Ben Buckler giving you a difficult dynamic range. But if the sky is diffused by clouds this would be easier. Other than that shooting here is pretty straight forward. Watsons Bay Lighthouse located on the Eastern Beaches of Sydney. Location:Old South Head Road, Watsons Bay. How to get here: Bus Service, Driving. Whats worth shooting nearby: Other than this lighthouse at the south point of the head land is the Hornby Lighthouse, Watsons Bay itself is nice with moored boats. Shooting Tips: Getting the best view of the lighthouse you really need to get on the cliff edge which can be dangerous. So please take care. Shoot here on pre dawn like in our shot you get those beautiful sand stone tones come through in the cliff. A wide angle lens here will work a treat as you will be able to see further down into the water below. Whats worth shooting nearby: Shooting from Beach Street over Coogee Beach is a rewarding sunrise location when you get a great full view of the beach. Or getting up close and personal around the baths as well can give you a whole range of views and angles of the ocean baths. Shooting Tips: Nothing to challenging here. Location: North End of Manly Beach, up the stair case above the ocean baths to the carpark top. Or via Queenscliff Road. How to get here: Bus Service, Driving, Pay and Display Parking at Manly Beach. Walking to this location is easy. Whats worth shooting nearby: Moving down onto North Steyne you will have a full view of Manly Beach. Shooting into the ocean baths at Queenscliff is best left for sunset unless the sun if far enough around to light the area on sunrise. (Closer to the end of the year this will be possible). Shooting Tips: Shooting from here with a wide angle lens looks great, but keep in mine that the wider you go with your focal length the smaller the beach will look as you add in more foreground and sky. Great location to try out a digital panoramic. Whats worth shooting nearby: Freshwater Beach is my favourite beach to shoot on the Northern Beaches. It is a very shallow beach so on high tide the water can roll up the beach and then soak into the sand to give you a mirror-like surface in the foreground of your shot. On the opposite side of this image, you can access the cliff area through the park area on Pavillion Street. Shooting Tips: Be careful when accessing cliff areas, especially in low light or high winds. Location: Balmoral Beach, The Eplanade. How to get here: Bus Service, Driving, Pay and Display Parking. Whats worth shooting nearby: Anywhere along the beach will give you great views of the Hunters Bay area. With the center rocky island that breaks the bay in two. This shot is from the island shooting into the Balmoral pavilion. Shooting Tips: Nothing to challenging here. The best angles put the rising sun to your left and right. Location: Bondi Beach, Notts Ave.
How to get here: Street Parking, easy walk from Bondi. 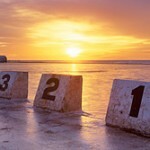 Whats worth shooting nearby: Australia’s best-known beach and one that is packed full of locations and opportunities. Photographers have made their whole careers shooting just this beach. One very popular location is the Bondi Icebergs at the opposite end of the beach. You don’t even need a big swell at Bondi to get some amazing water explosions off the ocean baths either. Shooting Tips: Nothing too challenging here. The best angles put the rising sun to your right or in front of you. Location: Blues Point Reserve, Henry Lawson Ave.
How to get here: Street Parking, Ferry from Circular Quay or Darling Harbour, Bus. Whats worth shooting nearby: From this location, you can shoot directly at the Sydney Harbour Bridge which works well both on sunrise and sunset. Shooting Tips: Nothing too challenging here. The best angles put the rising sun to your left and right. Location: Carrington Parade, Curl Curl. How to get here: Street Parking, Bus. Whats worth shooting nearby: Shooting from the top of South Curl Curl Ocean baths will give you a nice view down the beach. Or closer to the ocean baths there is a nice collection of mossy rocks that make for a nice composition. Location: Marine Parade, Manly (Manly to Shelly Beach Walk). How to get here: Pay and Display Parking Manly and nearby streets, Bus, Manly Ferry from Circular Quay. Whats worth shooting nearby: From this location, you can shoot directly down into Shelly Beach, or you have the nearby Cabbage Tree Baths that make for a great sunrise location as well. If you walk further on you can shoot the whole of Manly Beach from the top of the rocks at the end of the walkway. Shooting Tips: Nothing too challenging here. The best angles put the rising sun to your right. How to get here: Pay and Display Parking, Bus. Whats worth shooting nearby: At the south end of Coogee is the ocean baths which are a rewarding photo on their own. Shooting Tips: Nothing too challenging here. The sun will always be on your left when shooting this location. During the year the sun will light more or less of the beach depending on the time of year. Whats worth shooting nearby: On sunrise shooting across Bronte Beach from the walking are along Bronte Marine Drive can also be rewarding as the morning light hits the sandstone cliffs above the baths. Shooting Tips: Shooting from the baths into the rising is best done if there are clouds to absorb and break down the strong dynamic range between the sky and foreground. If you have ND grad filters, use them. I hope you have liked this guide. I’m a full-time professional landscape photographer with my own gallery in Newcastle. I also own and run my own professional photo lab “Still Creations Photo Lab” where they do all my work like canvas printing and stretching, acrylic face mounting, Aluminum printing, bamboo and picture framing. Our lab is open to the public and we cater for amateur and professional photographers looking to get the best from their images. A comprehensive list of perfect photography locations around Sydney that are perfect to get that iconic sunrise photo. 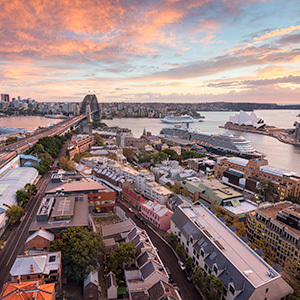 This entry was posted in Photo Guides and tagged 12 best sunrise locations sydney, sydney best sunrise locations, sydney photo locations, where to shoot sydney on sunrise. Bookmark the permalink. Thanks Matt, great article. I already used as reference last time I visited Melbourne, and it’s in the bookmarks for my next visit. This article is exactly what I’ve been looking for. Being new to both Sydney and photography I think I now have some early morning excursions to plan…thanks for the inspiration Matt. Thanks Gareth, glad you found it so helpful. So many great locations in and around Sydney it’s hard to narrow them down to such a small list. Thank you for your time and fantastic article. Your photographs are inspirational.